At 2019 Mobile World Congress (MWC 2019), Rain, South Africa’s mobile data-only network operator, announced that it has launched the first 5G commercial network in South Africa in partnership with Huawei, the leading global ICT solutions provider. This move has made South Africa one of the first countries globally to launch 5G. Huawei launched full range of 5G end-to-end product solutions, from core network, the bearer network, and base station to terminals in the beginning of 2018. The company also launched 5G phones at MWC 2019. Apart from deploying new base stations, Huawei’s solutions enable rain to fully leverage its existing LTE network and allocated spectrum for 5G deployment. This approach of sharing facilities and leveraging existing infrastructure will enable rain to roll out the 5G network in a quick and cost-effective manner. Ms. Jacqueline Shi, President of Huawei Cloud Core Network Product Line, said: "It is an important step to work with rain in bringing the first 5G network construction in South Africa. With our leading solutions, we are committed to working with operators and partners to build future-oriented networks for smooth evolution and migration for the maximum value out of their investment and the best user experience." 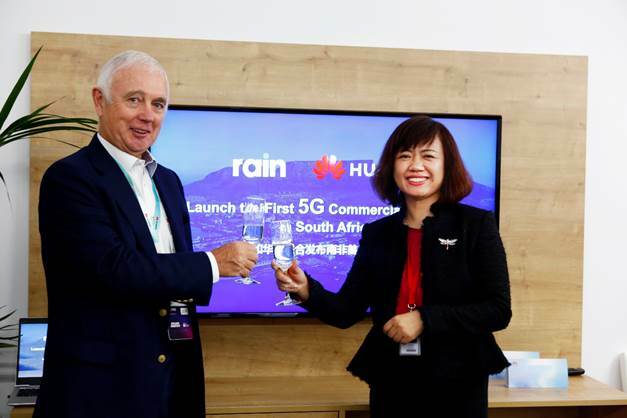 According to the plan, rain will continue to expand the 5G network to cover all the major metropolitan areas in South Africa with 5G networks to provide ultra-broadband services to homes and enterprises. Roos, further notes: "rain is excited to build South Africa’s first large scale 5G network which can provide fast wireless internet to more citizens. We are supportive of President Ramaphosa’s investment drive in the country and hope to contribute to readying South Africa for the Fourth Industrial Revolution." MWC 2019 runs from February 25 to February 28 in Barcelona, Spain. Huawei showcases its products and solutions at booth 1H50 in Fira Gran Via Hall 1, booth 3I30 in Hall 3, the Innovation City zone in Hall 4, booth 7C21 and 7C31 in Hall 7.